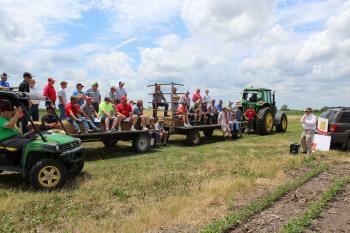 On June 28, Iowa State University Extension and Outreach will be hosting the annual Spring Field Day and Certified Crop Advisor (CCA) Training at the Southeast Iowa Research and Demonstration Farm near Crawfordsville. The morning will feature a CCA training session, which will begin at 9 a.m. The morning CCA training session will feature the topic of soil health concepts and measurements by Marshall McDaniel, Associate Professor of Agronomy at ISU. McDaniel will provide an overview of what soil health is, measuring soil health, and associated challenges. There will be a field component to the morning session demonstrating different ways to measure soil health. CCA's can 4.5 hours of continuing education credits by attending the morning session and the afternoon field day. The field day, which is free and open to the public, will begin at 1 p.m. Topics that will be covered during the field day include: “Crop Season Review” by Myron Rees, farm superintendent; “Practical Ways to Measure Soil Health” by McDaniel, “Dicamba Management in 2018” by Bob Hartzler, ISU Extension Weed Scientist; “Planting Corn into Cereal Rye: Termination Timing and Planting Demo” by Alison Robertson, ISU Extension Plant Pathologist. Pre-registration for the CCA morning session is required and can be completed by completing the online registration form. Check-in begins at 8:30 a.m. on the day of the event. The registration fee of $50, which includes lunch, can be paid with cash or check at the door. If you cannot register online, call ISU Extension Johnson County office at 319-337-2145, or contact Meaghan Anderson at mjanders@iastate.edu. Please register by June 22 for the morning CCA session. There is no cost or pre-registration for field day in the afternoon. We hope you can join us for the CCA training and the field day! More information about these events can be found on the event flyers: CCA Training Flyer and Spring Field Day Flyer. The Southeast Research and Demonstration Farm is located at 3115 Louisa-Washington Road, Crawfordsville. To reach the research farm go 1 3/4 miles south of Crawfordsville on Highway 218, then 2 miles east on G-62, then 3/4 mile north. Rebecca Vittetoe is an extension field agronomist in southeast/south central Iowa. Educational programs are available for farmers, agribusiness, pesticide applicators, and certified crop advisors.